Six Flags over Georgia in sunny Atlanta was opened in 1967. The 100 acre park features over 50 amazing rides. Its collection of roller coasters includes the famous Goliath and the Mind Bender. Get ready for some heart pumping action on one of these beasts. Guest can take a refreshing rafting trip on Thunder River or enjoy the scenery from a beautiful classical carousel. Arcophobia is the world’s first floorless free fall tower that plummets riders 14 stories toward mother earth. Take a break from the hot, Georgia sun while enjoying thrills and chills on Skull Island. This area of the park includes 6 twisting and turning water slides, 3 water pumping towers and lots of interactive wet and wild fun. 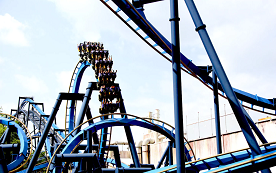 To view Six Flags Over Georgia Tickets, Specials and Coupons, go to their special page by clicking here. Six Flags Over Georgia updates this page throughout the year, so check back to see if new specials and coupons have come in. Note to our visitors: Six Flags Over Georgia Specials and Coupons can change without notice. So please visit their official website to make sure of the latest pricing and coupons.